Grass airfield 11/29 approx 903m long x 20m wide. Elevation 560ft amsl. The strip slopes 541ft (West end) upto 568ft (East end) Total of 27ft difference W-E.
Hemploe Strip is Unlicensed - Pilots use the strip at their own risk. Current state of the strip will be available by phone call with the office. 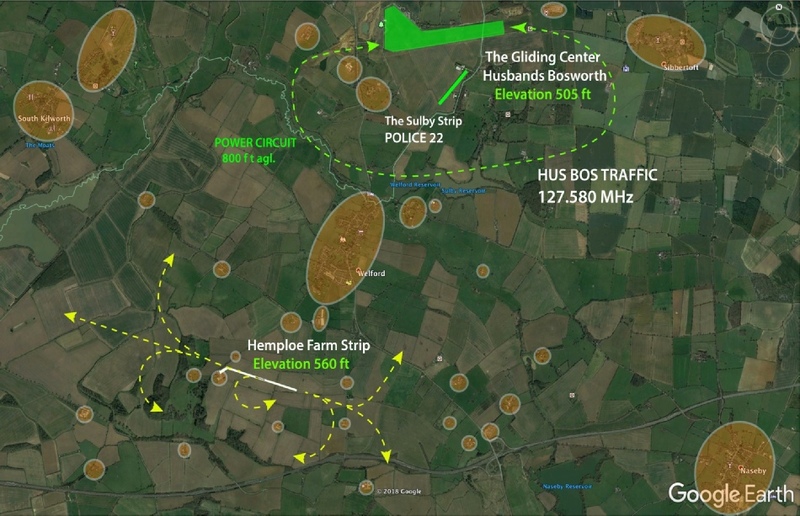 All circuits to the South of the runway to avoid Welford village and the Gliding Centre. RWY 11 Right Hand Circuits. On arrival report to the office and complete the aircraft movement log. 30-45ft high Trees along Hemploe Drive. Horses and pedestrians on the bridleway/footpath along Hemploe Drive. Horses and livestock in fields around Hemploe Farm Strip. Intense gliding activity and glider launching at Husbands Bosworth airfield. On departure, recommend to maintain runway heading until passing 500ft. for all powered ground movements. Avoid overflying all buildings in the circuit. Avoid overflying all villages below 2000ft agl.